I love reading books with my kids before bed. It’s especially fun when it’s a book I enjoy too, and not, say, something inspired by Legos or Transformers. To me, the ideal bedtime storybook is colorful and well-paced and has a little spiritual weight to it, too. So I was only too happy to receive review copies of two new children’s books from Loyola Press. Both are part of their Two Feet of Love in Action series, a collaboration between Loyola Press and the United States Conference of Catholic Bishops Department of Justice, Peace, and Human Development. The goal is to help kids recognize the link between faith and social justice, and to build awareness of the importance of concrete actions to make the world a better place. They’re terrific books, each one taking on a different aspect of social justice. In Green Street Park, a little boy realizes that the park where he loves to play basketball is actually littered with trash and full of weeds. He sees the need and, with the guidance of his teacher and mother, is inspired to mobilize his friends and start a campaign to clean up the park. (In a nice touch, the book invokes the example of St. Francis of Assisi as a model of someone who cared about the earth and the environment). 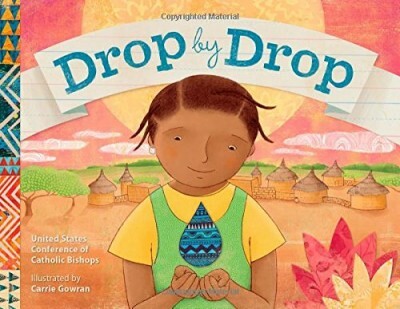 Drop by Drop tells the story of a girl named Sylvie, who lives with her family in the West African country of Burkina Faso. Because her village has no running water, she must walk three miles each day to the river to fill a large water jug for the family. Sylvie desperately wants to go to school, but her family needs her to fetch the water. Finally, one day Catholic Relief Services builds a well in her village, and Sylvie’s wish of attending school comes true. In the book, her story inspires schoolchildren in the US to raise money of their own to build wells in other villages. I love how the books show two different faces of charitable works. One focuses on a need close to home, the other on a need far away. There are so many ways to work for social justice; that’s a great lesson for kids to learn early on. The books are gorgeously illustrated, too. Green Street Park has vivid primary colors that pop off the page; Drop by Drop has softer, more muted tones that capture the colors of the desert, punctuated by the bright colors and lively patterns of the clothing worn by Sylvie and her family. They’re lovely to look at and their strong visual appeal is perfect for sparking young readers’ imagination. What’s great is that there are also supplementary materials that go along with the books. Each book can be purchased alone or with the Pray Me a Story guide, short guides that parents or teachers can use to help kids engage prayerfully with the story they have just read. They include questions and a guided meditation to help kids bring Jesus into the story and into their own lives. They’re a great way to help kids process the books and help the lessons stick. 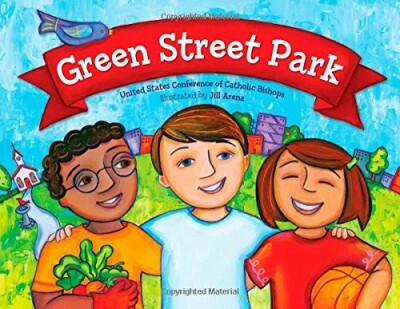 All in all, these are engaging, colorful ways to introduce kids to the connection between faith and social justice. It’s fun to plant the seeds and see when and how they bloom. Check out the Loyola Press website for more information about these books, and the Two Feet of Love initiative. (Both books are also available on Amazon.com) And if you like the idea of Pray Me a Story, you can see the whole range of guides they offer, including for picture books you probably already know and love. I’m a sucker for Christmas books. One of the joys of this time of year is revisiting my favorites — Dylan Thomas’ A Child’s Christmas in Wales, Dickens’ A Christmas Carol, and the various collections of Christmas verse and art that I’ve acquired over the years. And this year, I’ve stumbled upon another marvelous book for my collection. 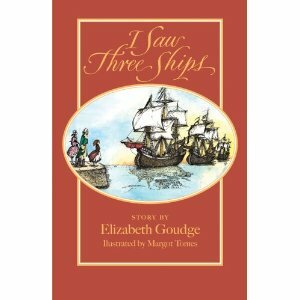 Elizabeth Goudge’s I Saw Three Ships is a petite book — at sixty illustrated pages, it’s short enough to read in one sitting (if you don’t have a toddler in the vicinity, that is). It’s a book for kids, though — as with most great children’s literature — adults can get just as much out of it. It’s a charming story of a little girl named Polly Flowerdew who lives with her two maiden aunts in a seaside town at the start of the nineteenth century. Polly wants to leave the house unlocked on Christmas Eve, believing the old country custom that says that the Wise Men may come calling. Her aunts, who are far less whimsical and trusting, are against the idea. (“There are no wise men. I have never met a man yet who was not foolish,” pronounces her Aunt Dorcas.) But Polly’s idealism softens them, and by the end of the evening, three wise men have indeed come calling … along with a miracle that no one in the town could have expected. It’s a hard story to write about, because to say more about the plot will give it away. Suffice to say that it’s a true gem of a book, with some very moving symbolism around the three wise men and their gifts of gold, frankincense, and myrrh. At times, the author’s humorous characterizations reminded me a bit of Roald Dahl (of Charlie and the Chocolate Factory fame), though without the mordant tone. And it’s amazing how the author manages to weave the story together with such grace and in such a short number of pages. She is very subtle in her storytelling, which is why this is really a book for older kids/preteens, though you could read it aloud to younger kids and pause to explain some of the less obvious bits. All in all, it’s a beautiful and uplifting read for the holiday season. And yes, it is inspired by the old carol, the lyrics of which are featured at several points in the book. Here’s a great rendition of it by Sting (is it just me, or does he never seem to get old?). It’s hard to think of a more joyous holiday song than this one. 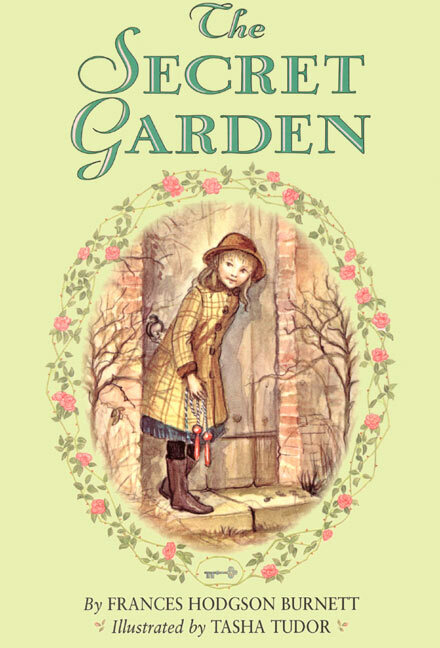 When it comes to writing about The Secret Garden, it’s hard to know where to start. I could talk about how the book is largely responsible for turning me into a hard-core, lifelong Anglophile. (The Shoes books by Noel Streatfeild played a part in this obsession, too.) I could explain how it’s the story that first introduced me to Gothic literature, to the eerie deliciousness of a huge English manor house with winding passageways and cries in the night. I could wax lyrical about the edition I had as a child, with iconic illustrations by Tasha Tudor: the picture showing Mary Lennox breathlessly turning the key in the ivy-framed door, the pastoral image of the country boy Dickon sitting on the grass, surrounded by woodland creatures, the scene where Mary discovers the invalid Colin, his head lit up in an unearthly candlelit glow. Or I could talk about the story of this book, one that held me spellbound the Christmas that I was ten. An orphan girl is sent to a cold forbidding Yorkshire manor house, where she discovers the walled garden that has been shut up for a decade. She finds the key, goes inside, and discovers that although the garden may look brown and abandoned, it’s not dead; there are green shoots coming up through the carpet of dead leaves, and the roses are “wick,” alive. With the help of one and then two and then three friends, she secretly tends the garden and brings it to joyous, colorful, vibrant lushness. And in the process, her own cramped soul expands and grows into happiness. A sickly boy learns to walk again, and a remote, depressed father learns to embrace life, not run from it. It all happens because of a garden that once seemed dead but which holds in its soil a potential for healing that no one in the book could have foreseen. And really, it’s this spiritual message that makes this book so moving to me now, almost thirty years after I first lost myself in its pages. Isn’t that the Christian story right there? — out of death, there is life; out of despair, hope. Nothing — and no one — is too far gone to be reclaimed and brought to his or her fullest, most beautiful potential. It’s a message that I see every spring in the garden, as I watch the roses that were once barren and stubby explode into color and fragrance. I could live to be five hundred, and I’d never get bored by that. Every single spring, it thrills me to watch the slow return of those shiny reddish-green leaves, then the buds, then the petals, all pushed into being by some force that I can’t see but which feels, every time, like a miracle happening just outside my windows. This book celebrates that force, that miracle, in all of its manifestations. And the characters all hunger for that miracle, whether they are conscious of it or not. They all long for Life, and by the close of the book, they’ve found it. And there is no happier ending than that. 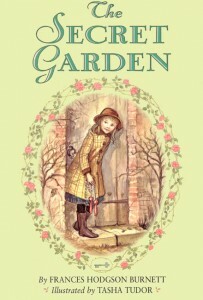 The Secret Garden by Frances Hodgson Burnett. To read more about the Spiritual Books series of posts, click here. Spiritual books for kids [and moms]: Happy Birthday to You! Posted on September 7, 2011 by ginny | Comments Off on Spiritual books for kids [and moms]: Happy Birthday to You! You have to love the cover of Happy Birthday to You! 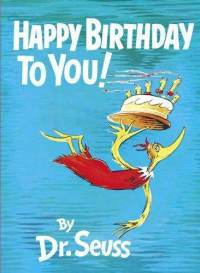 by Dr. Seuss: a large, friendly-looking bird flies through the sky, holding aloft a birthday cake with dripping candles. It’s a cover that promises fun, Dr. Seuss’s marvelous brand of fantasy, and deliciousness galore. And the book delivers on all counts. The story is a wonderfully colorful account of how they celebrate birthdays in the land of Katroo. As you’d expect from a book by Dr. Seuss, it’s a little different from what we do here. In Katroo, you are awakened in the morning by the Great Birthday Bird, who flies in through the window and greets you with the “Secret Katroo Birthday Hi-Sign and Shake/That only good people with birthdays may make.” From there, the bird leads you on all kinds of fantastic adventures. You climb to a high peak and shout, “I am I!” You eat hot dogs rolled on a spool. You wash off the mustard in the Mustard-Off Pools, which are fabulous terraced pools built on a hillside (as a kid, I wanted desperately to be the little boy in the picture, swan-diving joyfully from one pool to the next). You are serenaded by Drummers, Strummers, and Zummers, as well as by Dr. Derring’s Singing Herrings. And at the end of the happy, wonderful day, the bird flies you home on a very soft platter, putting you gently into your bed, where you dream about the day you’ve just had. This book is a part of our collection thanks to our good friend Trish, who gave it to us as a gift last year. In her family, they’ve made a tradition out of reading it aloud on each child’s birthday, and I can’t think of a more appropriate way to end the day. More than any other kid’s book I know, this book teaches the importance of celebrating the people in your life … and that’s a message that you just can’t hear enough, at any age. Admittedly, it’s an effort to throw a party. It is often tough to get folks together, to clean the house and buy the drinks and hunt down the birthday candles, but there is no better investment, really, than a few hours in the company of the people we love. When you come right down to it, the best gifts we have in life are our friends and family. Sometimes, it’s easy for an introvert like me to forget that, or to default to time alone rather than in the company of others. But I like this book because it’s a glorious, exuberant, vibrant hymn to the joy of celebrations. It’s a reminder that the people we love deserve the hot dogs and the singing herrings and the mustard-off pools, or the closest approximation that we can give them outside of Katroo. At the very least, they deserve to know that they matter to us, that they are a unique splash of color on the canvas of our lives … and that the picture would be a lot less exciting without them. All these great things for you! Happy Birthday to You! by Dr. Seuss. To read more about the Spiritual Books series of posts, click here. Comments Off on Spiritual books for kids [and moms]: Happy Birthday to You! If ever there was a book that screams “sentimental favorite,” The Runaway Bunny is it. As a kid, I couldn’t get enough of this story. And when my oldest son Matthew was celebrating his first Christmas, I bought him this book as a special gift. It didn’t matter that he was only a few months old and quite a long way from being able to snuggle up and follow the thread of the story. I wanted him to have this book, and I wanted to be the one to give it to him. If you don’t know this story, it’s pretty simple. A little bunny tells his mom that he wants to run away. She responds by saying that wherever he goes, she’ll come after him. He tells her that he’ll turn himself into a flower in a hidden garden; she says she’ll become a gardener and come find him. He announces that he will turn into a rock high on a mountain; she says that she’ll become a mountain climber and climb up and find him. For every runaway scenario that he offers, she counters with a way that she can come and find him. And in the end, he decides that he might just as well stay at home and be her little bunny. There’s probably no more comforting message for a small kid than this: the assurance, gently conveyed through simple words and sweet pictures, that Mom will always come find you. She loves you so much that she’ll scale mountains and wade into rivers to get you back. When I was young, this story made me feel all cozy and secure inside. And as a mom now, I read this story to my little Matthew bunny, and I think: Damn right. I’d do all of that and more for my little guys. Like the baby bunny, no matter where I run, God will follow after me. I really believe that. Even during the years when I was no fan of organized religion, I always believed in my gut that there was a God who would never leave me. And wow, what a relief that is. What a gift to know that no matter what I do or how many epically stupid choices I make, I can’t skate off the edge of God’s love. There is someone out there who knows everything there is to know about me and who loves me anyway, enough to drop everything and take whatever form is needed to bring me gently back home. I can’t begin to express how comforting that is. And I love that I can share this book with my own boys now. I love that the words fill them with that quiet confidence that Mom will go anywhere she needs to go and do anything she needs to do to bring them back. And I love that this book is giving them a taste, a gentle and subtle and sweet taste, of the relentless goodness that is God. I hope they find as much comfort in it as I have. 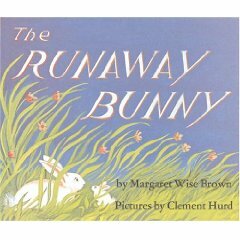 The Runaway Bunny, written by Margaret Wise Brown and illustrated by Clement Hurd. To read more about the Spiritual Books series of posts, click here.